The meat maestro behind Takashi walks us through 10 delicious bovine cuts, from aorta to second stomach. Don't be scurred. Taboos about unfamiliar animal parts—specifically innards—have left a huge culinary gap in the American dining experience. Why do we have no qualms ingesting chicken nuggets and hot dogs made from some undisclosed mishmash of crap, but turn away in disgust when it comes to the finest cuts of tongue and stomach? Since 2010, chef Takashi Inoue has been working to change perceptions of these less common cuts, bringing the offal he grew up cooking and eating in Osaka, Japan to Hudson Street in the West Village. At Takashi—a yakiniku-style restaurant, which translates literally to house of grilled meats—he challenges diners to rethink their notions about hearts, brains, and organs by serving them in their purest form. The focus is entirely on bovine cuts, sourced locally whenever possible, which patrons grill themselves at the table over 880-degree flames. Converts include Anthony Bourdain, who has declared the spot one of his favorite places to eat in NYC. Here, the chef leads us through ten types of offal that he breaks down, cleans, marinates, and serves for diners to cook—or eat raw—each night. Are you ready to chow down on some fresh aorta? Class is in session. Cows have four stomachs, but Americans are only used to seeing the second served as tripe. 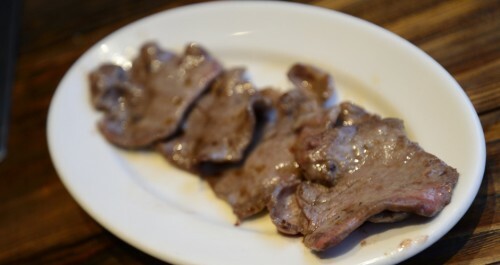 Takashi says that this stomach is a lesser used innard and that the flavor often surprises guests. The chef scores the meat across, making wavy ridges. This helps to create texture and decrease elasticity. Name on menu: Mino Flavor profile: The least fatty and mildest of the stomachs, the first is less chewy than other cuts from cows&apos; bowels. 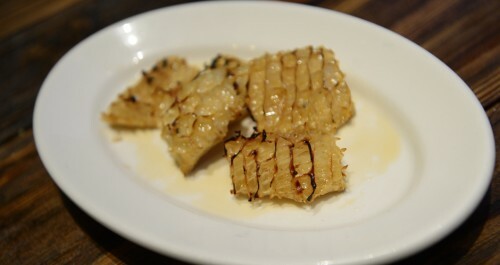 It is similar in texture to calamari. Cooking: Requiring a bit more time on the grill, the first stomach should be cooked until brown and crispy. Takashi suggests a simple salt marinade and lemon. 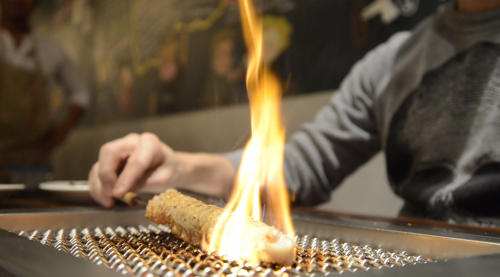 The large intestine is the one raw option that Takashi tells everyone to order. The sweet and round flavors satisfy American palates, and even kids tend to love this cut of innards. It starts as a large tube, and a stick is wedged inside to keep it from curling up while cooking. Name on menu: Tetchan Flavor profile: Super fatty and sweet. The uncut large intestine is dressed with sesame seeds, garlic, and chilies. Cooking: The intestine is cooked until it shrinks to a third of its original size (about 4–5 minutes) and develops a nice char. The fourth stomach is where milk nutrients are broken down within a cow. Takashi says that the fourth stomach is the most intense in terms of chewiness. 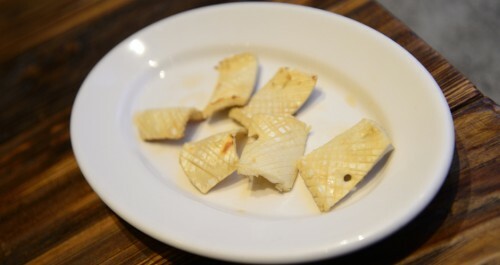 Name on menu: Akasen Flavor profile: Chewy and fatty, with bold, unctuous flavoring. Cooking: This stomach has the longest cooking time of all. It should be cooked completely through, turned over so that it is crispy on each side. Takashi prefers to use his secret barbecue marinade to cut through the fattiness. Commonly misconceived as being a part of the brain, sweetbreads are actually made up of the thymus gland located in a cow&apos;s neck. Most Americans have only eaten sweetbreads after they have been battered and fried. Takashi believes in the purity of this protein, and chuckled when asked about frying the buttery morsels. Name on menu: Shibire Flavor profile: Tender, with the mild flavors of earthy liver. Takashi describes the offal as being similar to foie gras. The consistency is gelatinous when raw but silky and buttery when cooked. Cooking: Cook for four to five minutes until they are firm in the center and have plumped-up in shape, sort of like scallops. Sweetbreads need more attention when cooking than other offal, and need to be turned regularly or else they will burn. The chef prefers his own secret sauce for nuggets. This is an innard that Americans may have seen before. 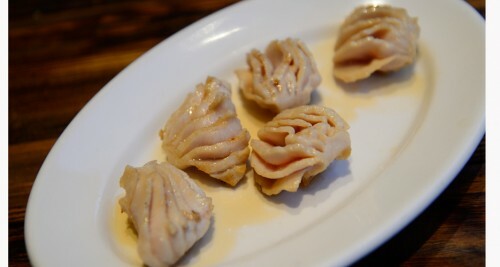 The second stomach is what Takashi refers to as "honeycomb tripe," and it is the most common type of tripe used at restaurants in the U.S. Name on menu: Hachinosu Flavor profile: Chewy and hearty. The lining of the second stomach has a natural honey combed texture. Cooking: The second stomach is the only raw meat on the menu that is par-boiled before service to draw out some of the funkiness. Because it is so chewy, it needs to be cooked longer than most other cuts, until all the ridges become browned and crispy. All the crannies are ideal for soaking up condiments, like Takashi&apos;s BBQ sauce. The aorta is largest artery leading out of the heart&apos;s left ventricle. Takashi makes intricate cross-hair scores across the cartilage prior to cooking. He explains that this cut is all about the texture. Name on menu: Kori Kori Flavor profile: The aorta does not boast much flavor on its own, but the texture has a pleasingly tough, chewy buoyancy. Cooking: The aorta cooks fairly quickly and is finished when browned. The cooked pieces take on the look of polished bone. 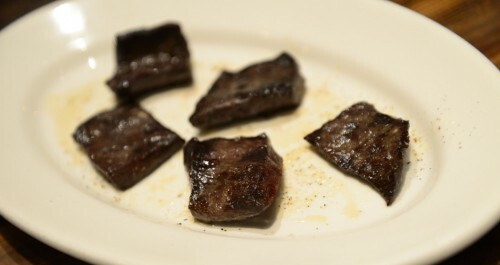 Takashi says it is the heart that tends to surprise people when they eat it, because the mineral-rich beef flavor is recognizable to most meat eaters. Name on menu: Hatsu Flavor Profile: Lean, beefy, and minerally, with a little crunch. Cooking: Heart should not be cooked long at all, only about a minute on each side. The color will be deep and vibrant. Takashi suggests only salt when enjoying this organ. Takashi refers to this cut as "beef bacon," and says that it is full of collagen and good for the skin. Name on menu: Tsurami Flavor profile: Very thin, mildly sweet, with subtle beefy flavors. Cooking: Because the cheek is sliced so thin, it does not need to cook long at all. If over-cooked it will become chewy. Takashi recommends only salt for the face "bacon." These slices come from the middle section of the tongue, with the rough outer layer already removed. Takashi pre-marinates the tongue with salt, garlic, and sesame before it is served to customers. Name on menu: Shio-Tan Flavor profile: The tounge is thin, juicy, and tender, similar to a very moist jerky or mild cured meat. Cooking: Takashi prefers his tongue to be served very rare, cooked only on one side. What may sound like a traditional cut and one that Americans often buy from the butcher is actually, by definition, an offal meat. 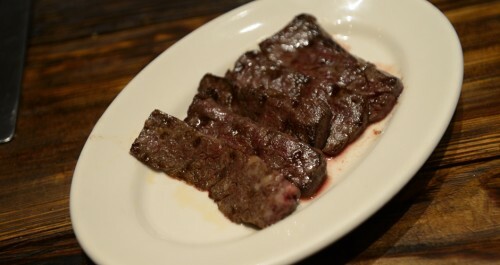 Takashi explains that, to many people&apos;s surprise, skirt steak is actually a cut taken from a cows&apos; diaphragm. 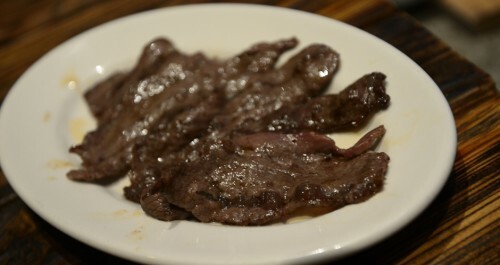 Name on menu: Harami Flavor profile: Robust beef flavors, very moist and tender. Cooking: This cut should be cooked very quickly due to the meat&apos;s thin cut and tenderness. Takashi recommends his own Takashi barbeque sauce for this.